Few things divide teams more than disagreement. We experience this in personal life as well as business and politics. Poor leaders believe in creating problems and divisiveness by telling everyone how bad things are. They bully people into agreeing with their ideas and are dictators not leaders. Though people may follow along for a while, this is an extremely poor and disastrous way to lead a team—or a nation. For too long, many of our “leaders” have succumbed to digging in their heels and refusing to make any progress unless it was their way. Is this your boss? Is it you? Build on what is positive first and find common principles. Do not simply tear down the past—especially if you are a new boss and have no history with the company. Respect your team members. Those who disagree are not “the enemy.” Many on your team may have more experience than you; don’t discount their contributions. Name calling and bullying is the worst thing you can do—and will only serve to dismantle the team and undermine success as well as trust. Ask your team to see conflict as a way to move forward—not a paralyzing force. Patrick Lencioni, in his book- The Five Dysfunctions of a Team, writes about “fear of conflict.” This is what allows some managers to get their way much of the time—when it is not always the best way. People don’t want to rock the boat. They are afraid of being fired. They think that sharing an opposing opinion is a waste of time. As a boss, if you foster this kind of thinking, you are doing your team and yourself a huge disservice. 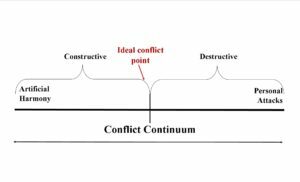 This diagram illustrates how we should see conflict. At the far left is “artificial harmony” where everyone just agrees with everything. We know everyone has lots of opinions, but they are not sharing them, and therefore as a resource of ideas and knowledge, these people are limited—not supportive team members. On the far left is very destructive conflict, in which people are openly attacking each other personally – which includes childish name-calling and degrading comments. 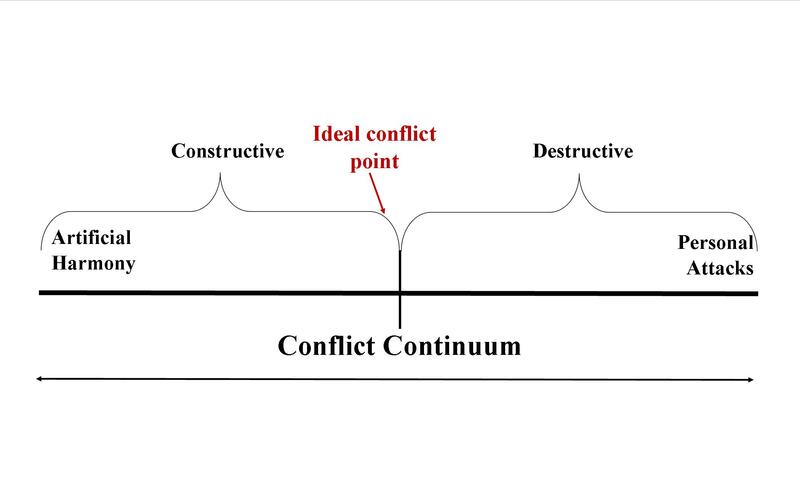 The middle of the diagram is the “ideal conflict point.” It is still constructive, but it represents having a variety of divergent ideas—without trying to destroy the personal integrity of team members. This is what great leaders should strive for and ask of their teams. Establish common goals and ideals. If your team is in total disarray (and most are not), start with your mission statement. This establishes your purpose and why you are together as a team. This has to be the basis for progress, and you must agree that progress toward goals is necessary—otherwise, there is no reasons for your existence as a team. In government, you always hear about “reaching across the aisle,” but this is more than just talking one-on-one. This is setting a common platform for everyone. Agree that it is ok to disagree. This is how a team comes up with a myriad of ideas on how to solve an issue and move forward. However, again the ultimate goal must be to move forward. Learn to compromise. This is not a bad word. If we do not learn to compromise, then instead of progress, you foster inactivity; no movement forward or backward. And those who refuse to learn about compromise and change will ultimately see their teams, businesses or indeed governments decline and fail. This entry was posted in Leadership Training, Meeting Facilitation, Team building tips by corporategames. Bookmark the permalink.